La Fiorita Brunello di Montalcino Tasting with owner Natalie Oliveros Wednesday February 6th at Wine Watch and all the Brunello in the store! The wine with top billing in Tuscany is for the last half of century is Brunello Di Montalcino, a DOCG from a fortress town south of Siena with reds of legendary power and longevity that have commanded lofty prices. The wines of this world-renowned region of Tuscany were conceived by the Biondi Santi family a century ago, today Brunello di Montalcino is produced under scores of labels, representing small farms, established estates and even international corporations. Brunello production averages less than 2 million bottles (166 thousand cases), but producers also make the DOC, of Rosso di Montalcino (usually the grapes produced from the younger vines and the fruit that is not of high enough quality to go into the Brunello) and many make a sweet wine called Vin Santo. Brunello is Montalcino is one of the hottest topics in the world of Italian wine today. The paradox here is that these wines are years away from showing their grandeur, when a customer wants a recommendation for a wine to take home tonight and drink, young Brunello is rarely come to mind. However, if you would like a taste of the wines of this elite red wine producing region, Brunello’s baby brother Rossi Di Montalcino has been one of the hottest wines in its price category in the store this year. In 1984 the Junior DOC of Rosso Di Montalcino was established. This younger brother of Brunello was brought about because in lower than average quality years they could bottle the wine with less time in oak therefore allowing the wine to have a more international style and more mass appeal, while still maintaining its distinctive Brunello character. 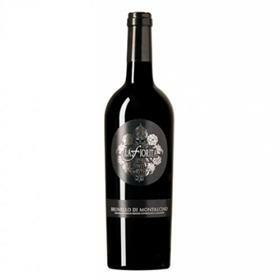 Young and fresh, this wine unlike its older sibling in that it is ready to drink upon release. Join us as we welcome the owner of La Fiorita Natalie Oliveros to South Florida for a tasting of her current releases along with a few older vintage wines from one of the top up and coming producers from Montalcino. Chef Toni will be making a special meal to accompany the tasting wines and the fee for this tasting which includes dinner is $125 + tax, for reservations call 954-523-9463n or e-mail andy@winewatch.com. The fee for this tasting which includes dinner is $125 + tax for reservations call 954-523-9463 or e-mail andy@winewatch.com. Please let us know when you make your reservation if you don’t dig on Boar and chef Toni will be glad to accommodate you.